He’s always behind the wheel. He’s always driving those glamorous cars, putting them through their paces on the racing track. He’s always behind that white helmet, always unknown: Top Gear‘s anonymous The Stig. The identity of The Stig is a closely kept secret, but the BBC has been refused an injunction blocking publication of a book revealing the driver’s identity. And it looks like Top Gear may have to find a new man behind the visor. 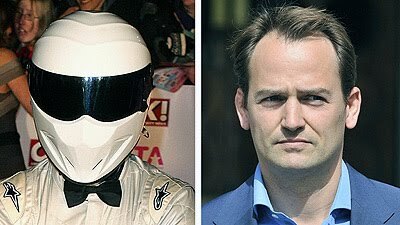 HarperCollins unveiled The Stig as 33-year-old racing driver Ben Collins in the upcoming book, which will be published in Britain on Sept. 16. It says on Collins’ website that he raced in Formula Three and NASCAR circuits, and drove James Bond’s Aston Martin in Quantum of Solace. CONTEST!!! Win a TOP GEAR Prize Pack!! !